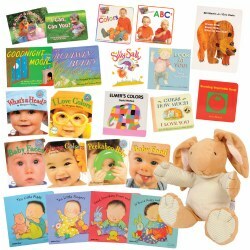 This kit offers the rich combination of engaging stories and interactive puppets that involve infants and caregivers in meaningful literary experiences. 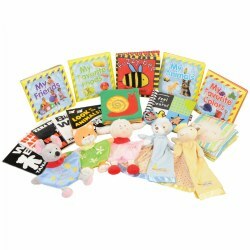 The vivid, textured, and inviting books, along with plush and friendly puppets, support early literacy skills and facilitate bonding experiences. 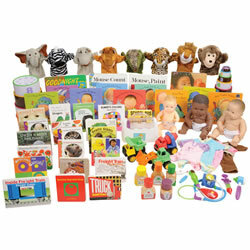 This kit contains toys for eight types of experiences that support children's development and learning. 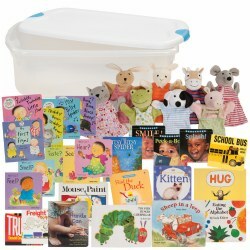 This kit features a sampling of items designed to enhance the experiences of "Imitating and Pretending" and "Enjoying Stories and Books" for Mobile Infants and Toddlers. 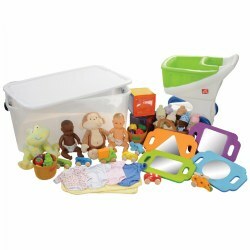 Kit includes (over 60 items): Toy Vehicles, Plush Toys, Purse, Shopping Cart, Baby Dolls with Doll Clothes, Board Books, and Puppets. 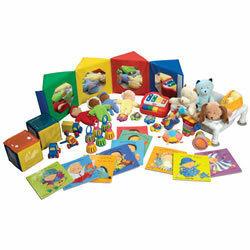 This kit contains toys for eight types of experiences that support children's development and learning. 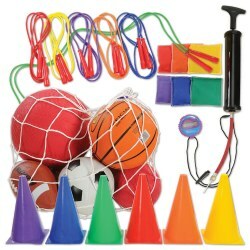 This kit features a sampling of items designed to enhance the experiences of "Connecting with Music and Movement", "Exploring Sand and Water" and "Going Outdoors" for Young Infants. 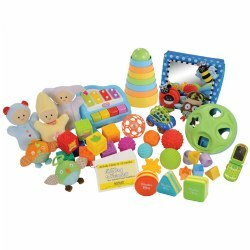 Kit includes (over 40 items): Soft Dolls, Play Vehicles, Photo & Mirror Cubes, Plush Animals, Music CD, Musical Instruments, Board Books, and an Infant Sand and Water Table. 3 years & up. The hands-on exploratory nature of studies in the classroom taps into children's natural curiosity, resulting in a learning environment that is both fun and intentional. This Social-Emotional Learning Kit offers a wide range of tools and materials to support and encourage rich dialogue about feelings and self. 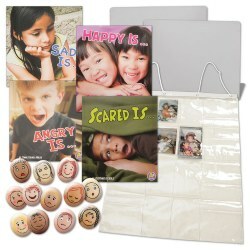 Kit includes: 12 Emotion Stones, Know Your Emotions Book Set (4 Books), Photo Display, and 2 Emotion Mirrors. 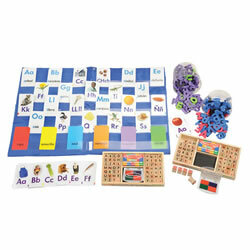 A pre-assembled kit for busy teachers to enhance classroom learning, making learning a fun activity. 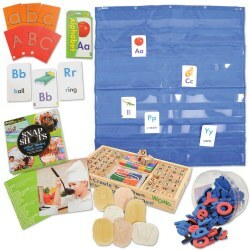 Bilingual literacy kit for children includes: 2 Sets of Alphabet and Word Cards in English, 2 Sets of Alphabet and Word Cards in Spanish, English Magnetic Learning Letters Set, Spanish Magnetic Learning Letters Set, English Alphabet Stamp Set, Pocket Wall Chart, and a storage container. 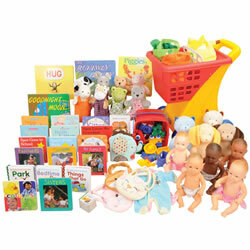 This kit contains toys for eight types of experiences that support children's development and learning. 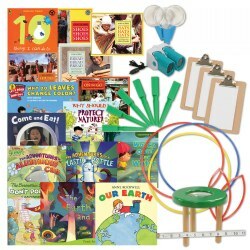 This kit features a sampling of items designed to enhance the experiences of "Imitating and Pretending", and "Enjoying Stories and Books" with Two year olds. 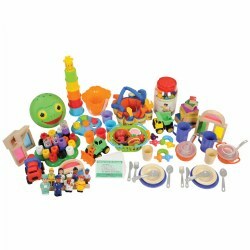 Kit includes (over 55 items): Baby Dolls with Doll Clothes, Shopping Cart, Little Doctor Kit, Kitchen Bottle Collection, Little Builder Tool Belt, Book Sets, and Puppets. Birth - 12 months. 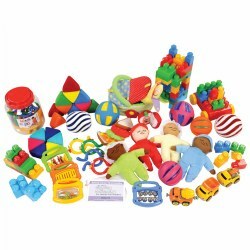 This comprehensive kit contains a variety of learning materials that will engage infants and offer growth and development in the areas of fine motor, blocks, gross motor, cognition, music, and dramatic play. 12 - 24 months. 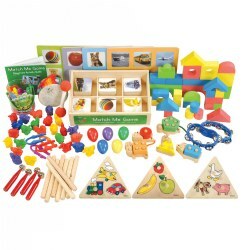 This comprehensive kit contains a variety of learning materials that will engage toddlers and offer growth and development in the areas of fine motor, blocks, gross motor, cognition, music, and dramatic play. 3 years & up. As a supplement to the Language and Literacy Skills Resource Kit (item #63058), these Spanish materials will support inclusion of the Spanish speakers in the classroom. 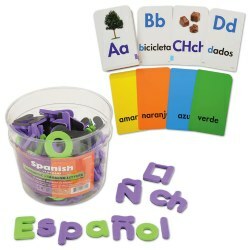 Includes: Magnetic Spanish Learning Letters and Spanish Alphabet and Picture Word Cards. Children have the opportunity to engage in a variety of learning experiences while engaging with the materials offered in this comprehensive kit. 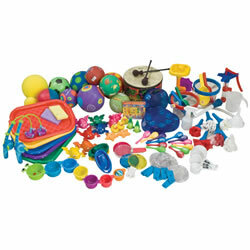 This kit offers puzzles, balls, links, plush items, stackers, and sorting activities to inspire active learning in all areas of development. 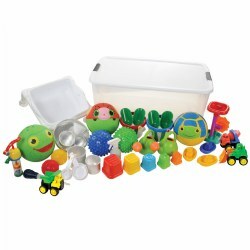 This kit will help strengthen: fine motor development, early math skills, gross motor development, eye-hand coordination, and cognitive skills. 24 - 36 months. 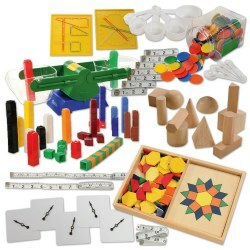 This comprehensive kit contains a variety of learning materials that will engage young learners and offer growth and development in the areas of fine motor, blocks, gross motor, cognition, music, and dramatic play. 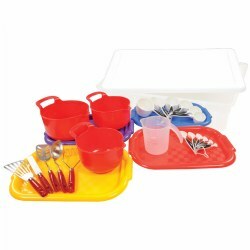 Engage children in meal and food preparation with this wonderful kitchen accessory set. Young learners will be introduced to nutrition, mathematics, vocabulary, cooperation and more while sharing in the experience of cooking and baking. Sand and Water play is a wonderful way to incorporate multiple concepts into hands-on learning. Open-ended, child-guided sand and water play engages children in a sensory, social, mathematical, scientific, and imaginative experience. 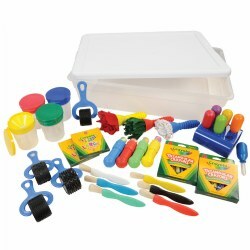 This kit includes materials to measure, scoop®, sink, float, sift, pump, and spray for endless interaction and ideas. Involve young children in reading and literacy experiences with this collection of books. Children can enjoy books independently, one-on-one, or as a group experience. Introduction of books, reading, and literacy in the early years will develop: vocabulary acquisition, listening skills, print awareness, language development, and concentration. Note: Kit components may change occasionally due to availability. We will substitute developmentally appropriate items for the purpose they were intended. Music and movement activities provide a wonderful foundation for all early learning environments. Young learners respond to the rhythm and flow of music in both creative and cognitive ways. 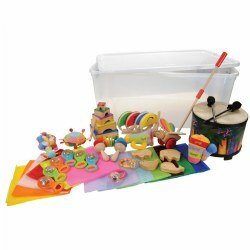 This kit incorporates a variety of instruments to provide a wide range of musical experiences. Music and movement activities can be used to: improve listening skills, build balance, rhythm, and coordination, develop body awareness, promote cooperation and turn taking, and strengthen fine motor skills. There are multiple benefits for children that participate in dramatic play experiences. Offering a variety of props and opportunities for children to engage and strengthen the following: creativity, problem solving skills, cooperation, language development, imagination, and understanding of their world.